The present study was aimed at assessing the work-family conflict of dual earner professional nurses from families of selected district of Delhi NCR. The research design was non-experimental descriptive type. A total of 250 samples were selected by purposive sampling from a district of South Delhi. Data were collected using sociodemographic parameters and work-family conflict scale. Data was analysed using SPSS version 17. Results of both descriptive and inferential statistics analyses revealed that the work-family conflict of dual earner nurses were high. In the light of the present study, it is concluded that dual earner nurses gender and organisation of work has influence on the work-family conflict. Work and family represent two of the most important aspects of adult life. Each of these variables contributes uniquely to our understanding of human behaviour. Gender role theory establishes that family and work roles have traditionally been gender-specific, where men are socialised to be work-oriented, women to be family-oriented (Gutek, Seark & Klepa, 1991). Empirical evidence also shows that work is more central for a man’s identity and family is more central for a woman’s identity (Cinnamon & Rich 2002; Mauno & Kinnuen 2000). However with the constant rise in women’s participation in paid work across the world, traditional notion about men and women have begun to decrease and more egalitarian notions have increased among both men and women (Botkins, Weeks & Morris, 2000). On the other hand women are a significant presence in the workforce today and more visible in managerial and professional positions. On the other hand, there is a trend of men accepting more responsibility for child care, meal preparation and cleaning. Historically work-family conflict (WFC) was defined as the extent to which functioning in one domain (e.g. work) negatively impacted the other. Subsequent research has established there are two directional components of work-family conflict that have different antecedents and consequences and can be conceptualised as separate but related constructs. These are family-to-work conflict (i.e. family engagement negatively impacting work) and work-to-family conflict (i.e. work negatively impacting family). High levels of work-family conflict (in either or both directions) are associated with negative outcomes for individual employees, their families, and organisations in which they work (Carlson et al, 2000). Traditionally, researchers have measured work-family conflict using different sub-domains of work-family conflict. For example, Greenhaus & Beutell (1985) identified three forms of work-conflict in: (a) time-based conflict, (b) strain-based conflict, and (c) behaviour-based conflict. Time-based conflict occurs when the amount of time spent on multiple roles prohibits the individual’s ability to adequately function in one’s work and/or family role (Bartolome & Evans, 1980). Sources of time conflict include: the amount of hours spent on the job and work-related travel, overtime, and shift work (Bohen & Viveros-Long, 1981; Pleck, Staines & Lang, 1980). Simmons, 2003). Behaviour-based conflict occurs when certain types of behaviour developed for one role (e.g. work) are inappropriate or dysfunctional when used for the other role (e.g., family) (Greenhaus & Beutell, 1985; Parasuraman & Greenhaus, 1997). An example of behaviour-based conflict includes aggressive behaviours that may be required at work but consid-ered inappropriate at home (Hammer, 2003). In India earning dyads constitute 52 percent of couple families in labour force (Indian Bureau of Statistics, 1996). Between 1979 & 1996 the number of dual earner couples increased by 58 percent while in the same period the total number of couple families increased by only 24 percent attributable to a 66 percent rise in the number of women workers, changing community attitude more flexible working arrangements and better child care availability (Indian Bureau of Statistics 1996). According to the 2011 census an overwhelming 51 percent of urban house-holds live on the income of a single earner, while double income families are a distant 26 percent. In rural area the situation is quite different, 34 percent of families are single worker, double worker families are slightly more (35%) (The Economic Times 2014). Sharma et al (2015) examined the extent to which work–family conflicts cause stress among nursing staff and its subsequent impact on their psychological health. It also examined if the emotional intelligence level of the nursing staff acted as a moderator between their level of stress and psychological health. A survey was carried out on 693 nursing staff associated with 33 healthcare institutions in Uttarakhand, India. A hierarchical multiple regression analysis was carried out to understand the relationships shared by independent (work–family conflicts) and dependent (psychological health) constructs with the mediator (stress) as well as the moderator (emotional intelligence). The results revealed that stress acted as a mediator between work–family conflict of the nursing staff and their psychological health. However, their emotional intelligence level acted as a mod-erator between their stress level and psychological health. There are few studies on work-family conflict in Indian context. Thus there is a felt need to assess the work family conflict among dual earner nurses. analysis. Hierarchical regression analysis was used to test study hypotheses. Study findings were (a) degree of family-to-work conflict influenced job performance negatively, (b) level of WFC did not signifi-cantly affect job performance, (c) support from friends strengthened the negative effect of family-to-work conflict on job performance, and (d) support from co-workers weakened the relationship between WFC and job performance. Lembrechts et al (2015) conducted a study to ex-amine the relative impact of three sources of work family conflict among hospital nurses; work-family policy use (child care assistance, schedule flexibility, part time work) job dimension (work overload, job autonomy, overtime work hours, night shifts) and organisational support (physician and co-worker support). The results indicated that organisational support, lack of work load and absence of overtime hours reduce family workload whereas work family policy does not. Leineweber et al (2014) conducted a study to assess hospital organisational factors influence work– family conflict in registered nurses: Multilevel modelling of a nation-wide cross-sectional survey in Swe-den. A multilevel model was fit with the individual RN at the 1st, and the hospital department at the 2nd level using cross-sectional RN survey data from the Swedish part of RN4CAST, an EU 7th framework project. The data analysed was based on a national sample of 8356 female and 592 male RNs from 369 hospital departments. It was found that 6 percent of the variability in work–family conflict experienced by RNs was at the department level. Organisational level factors significantly accounted for most of the variability at this level with two of the work practice environment factors examined, staffing adequacy and nurse involvement in hospital affairs, significantly related to work-family conflict. These results suggest that higher level organisational factors in health care have a significant impact on the risk of work-family conflict among RNs through their impact on the nurse practice environment. Lower level organisational factors should be investigated in future studies us-ing hierarchical multilevel sampling. Hanif & Naqvi (2014) conducted a study on work-family conflict effects employee performance at work place and also their personal life in Pakistan. Women have increasingly entered in the workforce and in-creased their aspirations for careers, and financial independence. These facts created a lot of room for current study. The aim of this study was to investi-gate the relationship between work family conflict and job satisfaction, employee job performance and psychological wellbeing. A self-administered and supervisor-rated questionnaire was used for data col-lection. Data was collected from female nurses work-ing in public health sector hospitals in Pakistan Ap-proximately 366 questionnaires were distributed; 154 questionnaires were returned out of which 143 were usable that constitute the response rate as 39.07 percent. The results reflect that the work-family conflicts are negative and significantly related with employee job satisfaction, employee job performance and psychological wellbeing. Jones (2013) conducted a study on the perceptions of African American nurses regarding the interaction between work-family conflict, job satisfaction, and psychological well-being. A qualitative descriptive design was employed to conduct six focus group sessions with 23 nurses at three universities in the south-eastern United States. Findings revealed that stressors such as racism or lack of teamwork and supervisor support caused the nurses to contemplate leaving a workplace or the profession. Family stres-sors, such as an ill family member, also influenced any decision regarding career longevity. Ahmad (1999) examined the intensity of work-family conflict experienced by married working women, the gender role orientation of their husbands, and the relationship between husbands’ gender role orientation and wives’ work-family conflict. Responses from 125 pairs of nurses and their husbands in dual-earner families on measures of work-family conflict and gender role orientations were obtained through self-administered questionnaires and analysed. Results showed that nurses experienced varying intensities of conflict in trying to meet the demands of work and family roles. Almost a third of the nurses experienced high intensity of conflict while slightly more than a third experienced low intensity of conflict. A non-experimental descriptive research design was adopted for the study. The data were collected from 250 subjects who were selected by purposive sampling from the dual earner professional nurses from district of South Delhi during the period 10-30 June 2016. Semi structured interview schedule was used to assess the sociodemographic data of dual earner professional nurses. The work-family conflict was assessed by using work-family conflict scale, an 18-item scale developed by Carlson et al (2000). Each item had five options like Strongly disagree, Disagree, Neutral, Agree and Strongly agree. The maximum score for the scale was 90. High score indicates high work-family conflict. Reliability. The reliability of the work-family conflict scale was examined by calculating the internal consistency by means of the Cronbach alpha coefficient. Alphas for each of the six dimensions were as fol-lows: WFC-time=0.90, WFC-strain=0.85, WFC-behaviour=0.87, FWC-time = 0.83, FWC-strain = 0.89, FWC-behaviour = 0.91. The internal consistencies for all six dimensions were acceptably high and above the suggested minimally acceptable range between 0.65 and 0.70. Data was analysed using SPSS 17th version. Mean and Standard deviation were used to assess the work-family conflict of dual earner nurses. Chi-square test was used to find out whether the selected demo-graphic variables have an influence over the work-family conflict. Sociodemographic characteristics of dual earner professional nurses: With respect to age, 47 percent belonged to the age group of 30-34 years, 23 percent to the age group of 40-44 years; majority of the dual earner nurses (67%) were females and 33 percent of them were from extended families; 57 percent of the nurses selected were diploma holders and 33 percent were degree holders. 73 percent of the subjects worked in the government sector and 27 percent were in the private sector; 53 percent of the study subjects had only one child. Majority of nurses received aid for household work (77%). Table 1 shows that the mean work-family conflict score is 69 for the dual earner nurses. The mean time-based work family conflict was 23, mean strainbased work-family conflict was 21 and the mean behaviour-based work family conflict was 23 (Table 2). Table 3 shows that 2 value 17.6 is significant at 0.05 nurses gender has an influence over the work-family conflict. Table 4 shows that 2 value 11.4 is significant at 0.05 level. Hence we can infer that dual earner nurses organisation of work has an influence over the work-family conflict. Work family conflict of dual earner professional nurses was high. Majority of the dual earner nurses under study were in the age group of 30-34 years, i.e. 47 percent. Since the study was conducted among dual earner nurses, the trend of dual earner families are evolved in recent years and it is not an old concept; majority of sample consisted of young adults. Most of the nurses (67%) were female and male nurses were a minority group compared to females. According to the 2016 data on health work force in India, the male to female ratio in nurses is 0.2: 4.0. Most of the sample consisted of diploma holders (57%). still the basic qualification for a staff nurse is diploma in nursing, so majority consist of diploma holders. Majority of the dual earner nurses in the present study were from nuclear family (73%) and remaining 27 percent were from extended families. Presently majority of the families are nuclear. Majority of the samples had only one child (53%), the sample for present study is dual earner nurses and this trend is due to the fact this concept is a recent one and dual earner nurses are more of younger nurses. It was found that mean work-family conflict score of dual earner nurses is 69, showing that dual earner nurses have high work-family conflict. The mean time-based work-family conflict is 23, the mean strain-based work-family conflict is 21 and the mean behaviour-based work family conflict is 23 and all these are high. From the study it was identified that there is a significant relationship between gender ( 2 value 17.6 and is significant at 0.05 level) and organisation of work ( 2 value 11.4 and significant at 0.05 level) of dual career nurses and their work-family conflict. Also no significant relationship between the spouses’ occupation and work-family conflict of dual earner nurses. Based on the study findings following recommenda-tions are made. The study can be replicated in a large sample to increase the generalisability of findings. A similar study with random sampling of subjects can be conducted. A study can be conducted to find out the work family conflict and job performance of dual earner nurses. An interventional study can be done such as the effect of time planning on work family conflict of dual earner nurses. The findings of the present study and the concept of work-family conflict of dual earner professional nurses have implications in nursing practice, nursing education and nursing research. Nursing practice: Nursing administration should consider the dual earner nurses demands positively while arranging time planning for them in such a way that they get enough time to do their family responsibilities also. 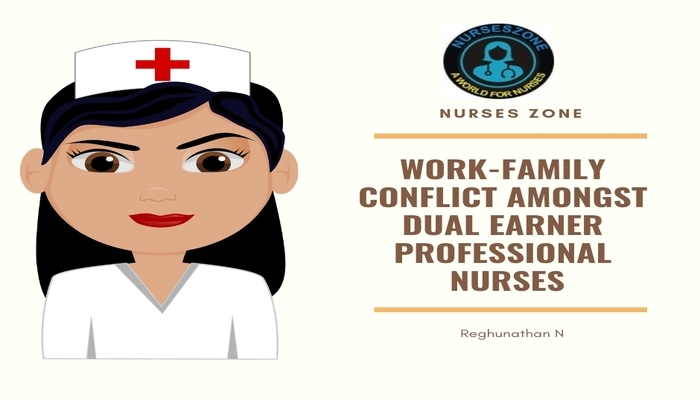 Nursing administrators can assess the work-family conflict of dual earner nurses of their unit and the data can be helpful in planning the unit activities. This will help to improve the job performance of professional nurses. Nursing education: Dual earner families is very common in the present day society, so component of work family conflict can be added in the nursing curriculum which help the future nurse administrators effectively plan and implement the time planning and area assignment of nurses. Nursing research: Recommendations arising from the present study can be utilised for conducting future studies. Similar study can be replicated in a large sample. Based on the findings of the present study, it is concluded that: work-family conflict of dual earner nurses is high, i.e. time-based, strain-based and behaviour-based work family conflicts are high. Further, dual earner nurses gender and organisation of work has an influence over the work family conflict. The author is Nursing Officer at All India Institute of Medical Sciences, New Delhi.